The songwriters of "Dear Evan Hansen" and the author of "Dear Evan Hansen: The Novel" will appear in Seattle in October to promote the novel of the hit Broadway musical. You don’t have to see “Dear Evan Hansen” to know it. Not just the acclaimed songs of the Broadway show, but the story. The feelings. The angst. The show — which opened in December 2016 and won the 2017 Tony Award for Best Musical — is about an anxious high-school student named Evan Hansen who has a brief exchange with a classmate named Connor Murphy who later dies by suicide. Evan connects with Connor’s family on false pretenses, and what results is a heart-wrenching mess of secrets and deception that touch on grief, the mores of high school in the age of social media and an acute desire to belong. The show started with songs written by the award-winning team of Benj Pasek and Justin Paul, and a book by Steven Levenson. Now the show has been novelized, and Paul and Pasek will appear in Seattle on Sunday, Oct. 14, to celebrate the release of “Dear Evan Hansen: The Novel,” with its author, Val Emmich. 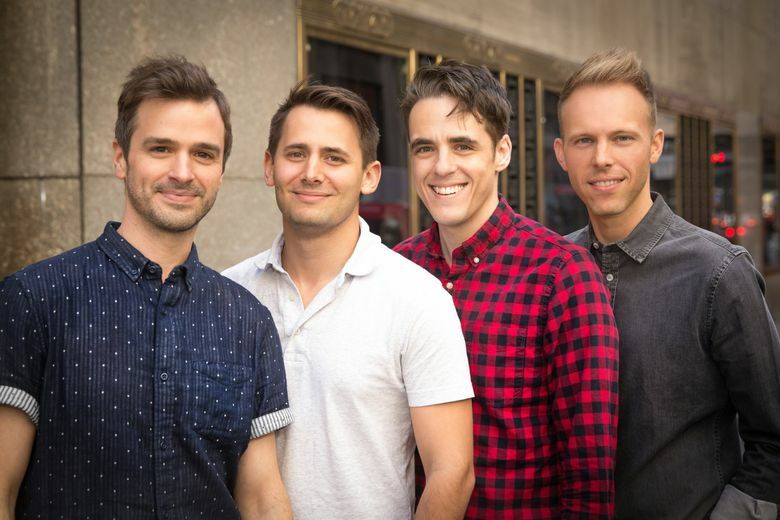 The three will discuss the new book and Pasek and Paul will perform songs from the show, with support from Seattle-based “special guests” Sarah Rose Davis and Kendra Kassebaum. Seattle is both those things — but it is also a long way from Broadway. So many of the fans who have embraced the show and the issues within — the majority of those fans young people — have done so without ever seeing the production. This will be the first time they connect with it in a live setting. Pasek and Paul won a 2017 Golden Globe and an Academy Award for Best Original Song in a Motion Picture for “City of Stars” from “La La Land,” and a 2018 Golden Globe for “This is Me” from “The Greatest Showman.” They’re familiar with Seattle, having written the music for shows like “A Christmas Story,” which first played at The 5th Avenue Theatre in 2010; “James and the Giant Peach,” which premiered at the Seattle Children’s Theatre in 2013; and “Dogfight,” which premiered at ArtsWest Playhouse and Gallery in 2014. Because “Dear Evan Hansen” deals with intense issues like the high-school pecking order, suicide and the minefield of social media, the team feels a certain responsibility to the fans, who have overwhelmed them and the celebrated cast with gratitude and personal stories. The show also has an email account where fans can post letters — and they have, with stories about how the show has helped them better connect with their children, understand their family members and deal with anxiety, depression and loss. “It’s amazing that something we worked on could give people verbiage for what they were going through,” Pasek said. As the “Dear Evan Hansen” phenomena grew, Emmich was brought on to write the novelization of the play. It’s an unusual step — musicals are often written from books, but not the other way around. He saw the musical twice, and was struck by the emotions on the stage — and in the audience. “The guys (Paul and Pasek) had a certain standard, they had a lot of emotional attachments,” Emmich said. “They had experienced backstage interactions with the fans that I hadn’t. They were carrying a weight that I was only learning about. All that adds to the anxiety. He decided to write it in first person, from the point of view of Evan Hansen, who has an anxiety disorder. “So my own anxiety helped,” Emmich added. Levenson said Emmich’s approach made perfect sense, since the musical feels like a first-person narrative. Pasek was grateful that the book allows fans of the show to better get to know Connor Murphy, the character who kills himself not long after having a brief exchange with Evan, during which he signs Evan’s cast. It’s never made clear — in the show or the novel — how Connor dies. The whole “Hansen” phenomenon has inspired its creators to do more. Pasek and Paul are working on the music for live-action movie musical versions of “Aladdin” and “Snow White” for Disney, and an original animated musical called “Foster” at Fox Animation/Blue Sky Studios. “We are in a way all really lucky that we’re living in a time when the people who came before us made it interesting and cool again to see a musical,” Paul said. “Things like ‘Frozen’ and ‘Hamilton’ and ‘Jesus Christ Superstar’ on TV.